New guidelines tell a significant number of heavy people with Type 2 diabetes to consider surgery to reduce blood sugars and weight. What are these surgeries and how do they work? There are four main types of diabetes surgery. All of them shrink your stomach so you eat less. Beyond that similarity, there are major differences. 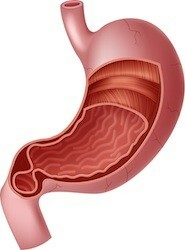 In the surgery called gastric bypass, or Roux-en-Y gastric bypass, most of the stomach is removed from the flow of food. A small section of stomach stays connected to the esophagus (pronounced eh-SOFF-a-gus,) where food comes in, and is sewn up into a ball the size of an egg. The ball is plugged into the middle of the small intestine, the jejunum (jih-JOO-num). The first part of the intestine, the duodenum, (dew-ODD-in-um) is taken out of the loop and reconnected below the jejunum, where digestive juices from the remaining large part of the stomach enter. You eat less, and absorb less of what you eat. Of course you will lose weight. The surgery also changes your hormone levels and response. Taking the duodenum out of the process means that more food gets to the ileum, the last part of the small intestine. That is where the insulin-regulating hormone GLP-1 (the one promoted by drugs like Byetta) is produced. You get higher levels of GLP-1, so better glucose control. Several other hormones are changed by this surgery. You may get lower levels of the hunger hormone ghrelin (GRELL-in) and gastric inhibitory polypeptide, which increases fat accumulation and insulin secretion, among other changes. The smaller stomach and intestine often have more difficulty handling food. One symptom of this complication is called “dumping syndrome,” in which bouts of symptoms such as cramping, nausea, and diarrhea occur after eating, when poorly digested food hits the small intestine. Reduced absorption of food can lead to malnutrition in some cases. One advantage is that, since nothing is actually removed from the body, Roux-en-Y can often be reversed. It’s a big deal, though. Up to 20% of weight-loss surgery patients need some kind of follow-up surgery to repair leaks and other things that can go wrong. Sleeve gastrectomy is much simpler. The big portion (fundus) of the stomach is removed and the rest of the stomach sewed up. This leaves a narrow tube like a sleeve between the esophagus and the intestines. The small intestine stays in the loop, so there are fewer hormonal changes. The main change is that ghrelin production goes way down. Produced primarily in the fundus, ghrelin is the hormone that tells you you’re hungry. You may never feel hungry again after sleeve gastrectomy. Sleeve gastrectomy raises after-meal levels of GLP-1 and another beneficial hormone called peptitde YY, or PYY, which makes you feel full. As with bypass, you will have to eat much less at a time after sleeve gastrectomy. Since most of the stomach is removed, sleeve gastrectomy cannot be reversed. Be really sure you want it before you go ahead, because it’s for life. Sleeve gastrectomy is usually done laparoscopically (a type of minimally invasive surgery) and does not involve long hospital stays. Adjustable gastric banding means wrapping a special silicone band around the stomach to create a small pouch with a small opening to the rest of the stomach. Nothing is cut or removed, but there are still hormonal effects, especially higher levels of PYY. The band can be adjusted to make it tighter or looser. It is a reversible procedure. Adjustable gastric banding is done through a laparoscope. There are only small incisions, but there are still risks. The most invasive of all these surgeries is the duodenal switch. Usually, a large part of the stomach is removed. The small intestine is divided into two separate channels. The channels are arranged with other digestive tubes like the bile duct in such a way that much less food, especially fat, can be absorbed. It’s a big surgery and risky, but it does appear to cure Type 2 diabetes. Ninety-nine percent of patients returned to normal cholesterol levels, 92% were cured of sleep apnea, and 83% got their blood pressure down to normal after surgery. There are surgical risks including blood clots and punctures of the intestine, and long-term risks such as malnutrition. Duodenal switch recipients must take lifelong supplements and be tested often for blood levels of crucial nutrients. All of these procedures have side effects and all of them will change your relationship with food, even more than diabetes already has. You’ll have to eat smaller amounts and spend more time doing it. You’ll have to be careful with every single bite you eat. Certain foods you will have to avoid completely. So should you have metabolic surgery or not? Next week, the last part of this series will go through the decision process.